Physiotherapists are health professionals who work in partnership with their patients to help them get better and stay well. Physiotherapy helps to reduce stiffness and pain, promote tissue healing and improve mobility and quality of life. At Body Works we specialise in the management of “musculo-skeletal” conditions. This means we help people of all ages with joint, bone, muscle and soft tissue injuries, such as back or shoulder pain, sports injuries and work related problems. We can help to restore movement and function when you are affected by injury, illness, disability or pain. We do this primarily through a combination of different manual therapy techniques, exercise prescription, movement, education and advice. In addition, we can help with injury prevention, health promotion and physical health life style advice. We work with you to help you to realise your goal, whether it is being able to walk around the park with your grandchildren, run the London marathon or prepare for a skiing holiday. “Physiotherapist” is a protected title, which means only those who have completed a physiotherapy degree or higher and are registered with the HCPC (Health and Care Professions Council) can work under this title. In addition to this our physiotherapy team all participate in post-graduate training to further develop our skills. 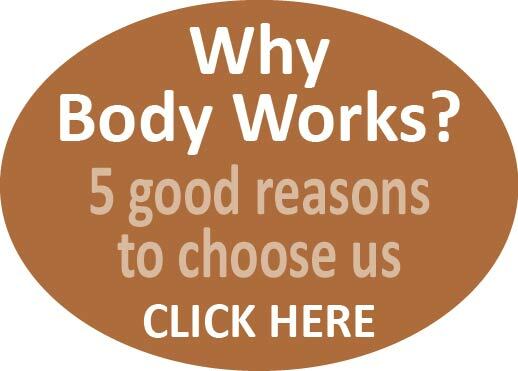 Here at Body Works we pride ourselves on being up to date with the current research and being passionate about delivering effective treatment that works for you.